New Delhi: At least five appointments to government-run fertilizer companies are hanging fire either because of differences between the fertilizer ministry and the appointments committee of the cabinet (ACC) or as no suitable candidates have come forward. Positions that need to be filled include managing directors of three fertilizer companies—National Fertilizers Ltd (NFL), Fertilizers and Chemicals Travancore Ltd (FACT) and Madras Fertilizers Ltd (MFL). Director-level positions in FACT and Rashtriya Chemicals and Fertilizers Ltd (RCF) are also vacant. The latest of the five cases relates to the appointment of the chairman and managing director (CMD) of NFL. The position fell vacant after V.K. Sharma resigned on 23 March. A joint secretary in the fertilizer ministry was given additional charge of NFL. Simultaneously, the Public Enterprises Selection Board (PESB) began the process of shortlisting candidates for the position. Two ministry officials with direct knowledge of the matter say that by June, PESB had recommended to the ministry that Neeru Abrol, director (finance) at NFL, be considered for the position. But the appointment is stuck as the fertilizer ministry has not approached the central vigilance commission (CVC) for a mandatory clearance. According to procedure, before ACC takes a final call on any appointment, the ministry concerned has to seek a vigilance clearance. “Typically, this process is completed within two months after the PESB recommends a name. But in this case the ministry has not approached the CVC till now, and for no explicit reasons," said one of the officials. Abrol could not be reached for comment on Monday. A text message sent to her mobile phone remained unanswered. The second case relates to the appointment of CMD, FACT, a position that fell vacant in October 2010. PESB said in a letter to the ministry that following interviews, the board found no suitable candidates for the position and recommended that an officer from any of the civil services be posted on deputation to fill the vacancy, according to the officials cited earlier. The officials say differences have emerged between the fertilizer ministry and ACC on who should be given additional charge of FACT. “Frankly, in this case, candidates that came forward were not good enough. So, the position will be opened," said the second official. Currently, a joint secretary in the fertilizer ministry Shyam Lal Goyal holds charge of FACT. Ministry officials say that while ACC is of the view that the senior-most director on the company’s board be given additional charge of FACT, fertilizer minister M.K. 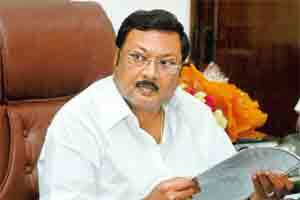 Alagiri is opposed to the idea. “The ministry has written to the ACC for reconsideration of the matter but no final decision has been taken as yet," the second official said. Alagiri could not be reached for comment. A phone call made on Goyal’s mobile phone remained unanswered. At MFL, I. Vijaykumar, an official of the Indian Revenue Service (IRS), is likely to be appointed CMD, the two officials cited earlier said independently. The position fell vacant in February 2010. “While the ACC had again recommended that the senior-most director on the company’s board be given charge, Alagiri was opposed to the idea," said the second official. “Finally, the position had to be opened to the civil service." Vijaykumar confirmed that he had appeared for an interview for the position but declined to comment further. Alagiri has also differed with ACC on filling up the position of director (marketing) at FACT, which fell vacant in November. In a December letter, reviewed by Mint, Alagiri asked Prime Minister Manmohan Singh to reconsider ACC’s recommendation that P.K. Chandrasekharan, a general manager with FACT, be given the position. He, instead, wanted the position go to M.P. John, an employee with Kerala Feeds Ltd, a Kerala government-owned company. Following this, both Chandrasekharan and John, who were on the PESB shortlist, approached the Kerala high court and the matter is stuck there. Similarly, for filling up the vacancy of director (technical) at RCF, while ACC suggested that C.M.T. Britto, a general manager (GM) with the company, be selected, the ministry sought the appointment of R.K. Jain, also a GM at RCF. The ministry wrote in this regard to the department of personnel and training (DoPT) on 19 October. A fertilizer ministry official said that this letter, also reviewed by Mint, came after ACC had rejected Alagiri’s demand. The position has been vacant since June. In September, Mint reported that 60 full-time, board-level positions and 250 independent director posts were lying unfilled at central public sector units. U.S. Awasthi, managing director, Indian Farmers Fertiliser Co-operative Ltd, said appointments held up for extended periods hurt a company’s day-to-day operations as well as long-term competitiveness, even if a senior government official has additional charge. “In the absence of a chief executive, no one else can take important decisions, because of which the company loses out in a competitive market environment," he said.